Unmatched views! A 180-degree panorama of the wide part of Old Hickory Lake. The view is due west, so the sunsets are terrific. Sit in the hot tub on the back porch while you watch the sun drop on the water! Gas log fireplace inside for relaxing evenings by the fire and gas grill outside for some quality summer barbeque. Sun room with wonderful views of the lake. Perfect location, nestled in the trees on a sloping quiet hillside. 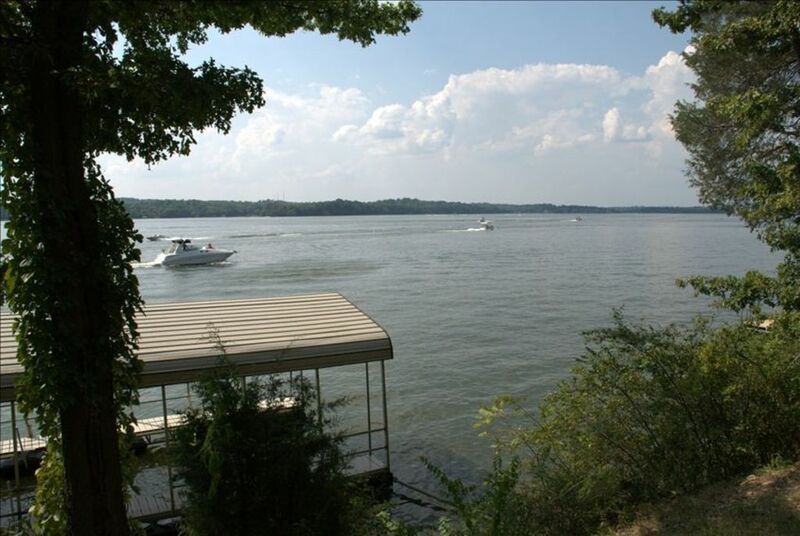 Panoramic setting overlooking Old Hickory Lake. This truly is a year-round paradise. Central heat and air in this lake home, an A-frame chalet built in the late 1970's. Deep water, with covered boat dock and more. This is not just a lake view, it is ON the lake. Fish off the dock in the front yard. Swim off the dock. Sip a beverage. The feel is incredible here, tucked away on a hill at the end of the road, surrounded by tall trees. Goodbye stress, you are on vacation at the lake. Keep your boat here, and fish as well. Fantastic retreat - a real lake cottage. On lovely part of Old Hickory Lake. Dock for boat or just relaxing. Hot tub on the back porch. Two car garage, with heat and air sources. Private and wooded. Your front yard is sloped right into the lake. Gated drive, huge decks and dock. Bedrooms now have hardwood floors. Fully stocked kitchen and linens for beds and bathrooms, cable TV, internet with wireless router and a computer for your use. Just 22 miles to downtown Nashville, and very easy to Nashville airport. Great for peace and quiet, thinking and creative pursuits. Great for creative time. Write your #1 hit song here! Please send inquires, you may call Horton Properties at numbers listed. Possibility for extra bedroom(s) for long term rentals. Deep water lot with a breath-taking view and a 38x18 covered dock, glassed sunroom, terraced decks. Heated 2 Car Detached Garage (could be a bunkhouse, art studio or music studio for long term stays?) Located at the end of the cul-de-sac with a electric gated entrance. Mature trees. Sit on your deck, facing west, and watch great sunsets with a 180-degree view of water. Monthly is negotiable, please inquire! $60 excessive cleaning fee can be applied upon inspection after check-out. **Rates are subject to change. Hortons enjoy the outdoors, that is why we love it here. We looked for 5 years, we trekked all over Middle Tennessee, searching for the perfect lake location. I was looking for something that reminded me of our lake cottage on Lake Champlain in Vermont, where I grew up. Finally found it here. Panoramic view, nice wooded lot, that slopes right into the lake! Huge dock, this is right on the lake. Private, secluded, peaceful ... yet minutes to all that Nashville has to offer. Fully stocked kitchen - everything you need to cook and eat! Dining table in the sunroom off of the kitchen/living room with a beautiful view of the lake. Parking for RV/Boat/Trailer. Waterfront, not Lake/Oceanfront. Ask for details. Large covered boat dock, great for boat, fishing, swimming, sipping a beverage. Minimum Age Limit for Renters is 21. Music in downtown Nashville, Nashville Predators hockey, Tennessee Titans football, Vanderbilt University, Belmont University, Tennessee State University and much more event-wise! Loved the sun room! The kids enjoyed the hot tub. The view was awesome and it was a short ride to down town. Well stocked cottage overlooking the lake/river. Nice sun room to enjoy the woods, the squirrels, the water, and the view of the boats going by. We enjoyed this snug house, well supplied kitchen, the boat dock, etc. We caught fish off of the dock, enjoyed the cranes flying around. Air conditioning in the house was great and the washing machine worked well. Didn’t try the hot tub, and the beds could use an upgrade... but all in all it was a good trip. Thanks. Great place to chill for a few days. Went over Thanksgiving to visit children. We are from Chicagoland and they are in Alabama. Good location for us to meet. It is so peaceful here. We had such a relaxing weekend getaway, without spending a fortune! The house has everything you need to cook and enjoy time with family. Gorgeous lake views! The is right ON the lake, at the end of Beacon Hill Drive in Mt. Juliet, TN. In-Season Rates (April - Oct): $250 per night, standard rate $1150 per week, standard rate $3950 per month, standard rate Holiday rates: $275 per night, holiday $1300 per week, holiday $4250 per month, holiday Off-Season Rates (Nov - March): $225 per night, off-season $950 per week, off-season $3350 per month, off-season $50 pet fee (covers multiple pets) All rates subject to change until final reservation is confirmed.